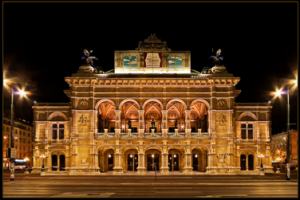 There is one thing that should pop in your head when thinking of Vienna: the Opera! Even if you’re not really a fan of operas in general, we highly suggest that you pay a visit to the opera in Vienna at least once! We’re positive you will have a good time. The State Opera of Vienna opened in 1869 with the premiere of Mozart’s Don Juan. The State Opera is the most important opera in Vienna and one of the most known opera houses in the whole world. The building was built in the style of the neo renaissance, however it wasn’t appreciated by the public back when it was built because of it’s back then strange architectural style. The original name of the State Opera was “Hofoper” which translates into “court opera”. Like many other buildings in Vienna, the State Opera was heavily destroyed in WWII. It re-opened in 1955 with the premiere of Beethoven’s Fidelio. The State Opera featured famous opera directors like Richard Strauss and is currently being directed by Dominique Meyer. The Opera is also known for the “Opernball”, which is a high-society ball, held every year in February and attended by many famous celebrities. Insider Tip: Every year from April till June and in September you can enjoy top ballet and opera performances open air while comfortably sitting in the Karajan square. And as if it couldn’t get any better, it’s for free! In 1801 the theater was opened by Emanuel Schikaneder in the color ochre from the outside with large empire windows and blue and silver from the inside. Due to fights and disagreements within the theater management, which led to its bankruptcy, Schikaneder was forced to sell the theater to his arch enemy. However he still had the privilege to manage artistic matters of the theater. In the following years the theater went through many varying stages of bankruptcy and success, one of its later successes being the start of the infamous musical “Mozart” in 1999. 2005 was the last year of the Theater an der Wien held the purpose of being a theater, because since 2006 it is officially the “New Opera House” of Vienna. Like the Raimund theater and the Ronacher theater, the Theater an der Wien is part of the “Vereinigte Bühnen Wien” organisation. In the Theater an der Wien you can not only enjoy great performances, but also get an amazing tour through the whole building for only 7 Euros! This is a great feature for theater lovers in general, but also for makeup and costume lovers, since you also get to go backstage and see the masks and everything. The tour is unfortunately only held in German, but in our opinion there’s a lot more to be seen there than heard anyway, so we guarantee you’ll have a blast! The smallest Opera in Vienna features everything from portrait concerts to unconventional reinterpretations. In fact the Kammeroper was built with the very intention of introducing new ways to opera, for example rock operas. If you consider yourself rather a fan of the classics you can of course also find plenty of those in the Kammeroper. It is as well part of the “Vereinigte Bühnen Wien” organisation. When it opened in 1898, the Volksoper had only a lyric-style stage. Operas and singing performances were introduced to it only later in 1903. Many famous Operettas had their first ever showings at the Volksoper and many famous opera singers started out here as well. After WWI the Volksoper had lost most of its purpose as it was then only a representative building, but after WWII things looked much better for the Volksoper, as it served as a replacement for the then damaged State Opera. Today, the Volksoper’s main focus lies in the showings of musicals and operettas, but it considers ballet and operas of course too.